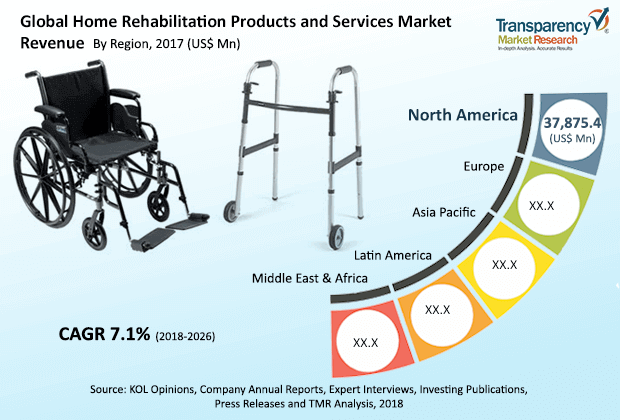 The demand within the global market for rehabilitation products and services has been rising on account of advancements in the domain of home healthcare, finds Transparency Market Research (TMR). The global market for home rehabilitation products and services displays a fairly consolidated competitive landscape, majorly due to the strongholds of a handful of market vendors. Furthermore, the leading market players have made concerted efforts to ensure that they reap continual revenues in order to maintain their position. It is projected that these market vendors would bank effective distribution channels to further expand their consumer base and fetch larger revenues. In order to eliminate possible competition, the leading vendors are projected to acquire emerging players in the global market for home rehabilitation products and services market. The market players have introduced all-time availability of products as the most recent policy in their quest for expanding their market share. Moreover, collaborative agreements are another key strategy that has outshone all other strategies meant to benefit the market vendors. Besides this, mergers, strategic alliances, and partnerships are also projected to be the key highlights of the global market for rehabilitation products and services. Transparency Marker Research (TMR) predicts that the global market for home rehabilitation products and services market is projected to expand at a healthy CAGR of 8.3% over the period between 2018 and 2026. Furthermore, the global home rehabilitation products and services market is expected to touch a value of US$ 161,743.4 Mn by 2026 from a value of US$ 88,484.0 Mn in 2017. The most important concern of the healthcare industry is to provide proper treatment and care to all population demographics. However, a large population of people are barred of the ability to visit doctors or hospitals due to their physical handicaps. Owing to this factor, the demand within the global market for homer rehabilitation products and services has been rising at a robust rate over the past decade. Furthermore, the urban population has become increasingly reliant on healthcare services provided at home, thus, enhancing the growth prospects of the global market for home rehabilitation products and services. The incidence of chronic diseases such as diabetes, cardiovascular disorders, and cancers has risen at unprecedented scale over the past decade. This has also created commendable growth opportunities within the global market for home rehabilitation products and services. Home rehabilitation services, in most cases, necessitate the presence of a medical expert or attendant to look after the patient throughout the day. Furthermore, special aids and equipments also need to be installed to meet the needs and requirements of the patient. All of this takes the cumulative expenses on home rehabilitation to unaffordable levels for a lot of people. Owing to this reason, the market is expected to suffer several roadblocks before attaining fruition on a global scale. Moreover, the lack of proper medical reimbursements and unavailability of medical staff also restrains the growth of the global market for home rehabilitation products and services.